Fine leather is the stuff that dreams (and dreamy shoes) are made of. Naturally-treated leather is costly and rare—its quality rests in the hide it’s made from as well as the tanning process to which it’s submitted. While much of the shoe leather made around the world is created under environmentally and ethically questionable conditions in the Far East, the leather used for our shoes comes from traditional French and German tanneries – we source our exotic leathers from special breeders who work in compliance with CITES. 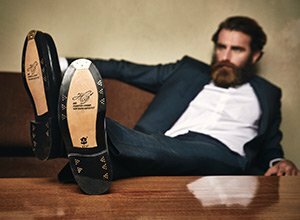 Enjoy our high-quality shoes with a clean conscience. »Gift auf unserer Haut« (poison on our skin), a widely watched TV report on leather production, caused a big stir in early 2014. Journalists uncovered a number of unpleasant truths, including the reality of tannery working conditions in Bangladesh. Viewers saw minors standing up to their knees in toxic tanning liquor and working on hopelessly outdated machines, a blatant breach of occupational health and safety codes. The tannery’s unfiltered by-products were unceremoniously dumped into a nearby river, turned red from pollution and clogged with floating rubbish. Earlier in the programme the viewing audience witnessed the plight of industrial cattle—emaciated and penned up in the backs of freight vehicles, they were transported thousands of kilometres to a slaughterhouse in Daku, where an excruciating death awaited them. Meanwhile, in Germany, a well-known shoe firm recalled 1500 pairs of contaminated shoes from its own line after learning that they contained significantly higher-than-permitted levels of Chromate VI, a reaction product created by improper tanning. A year beforehand, the Warentest (product testing) foundation already warned of alarmingly high levels of carcinogenic substances in children’s and work shoes. News like this provokes an angered reaction, followed by deeper reflection on the factors involved. The raw materials used to make leather determine its ultimate retail price. Up to 50 percent of the costs incurred during leather shoe manufacture go towards the leather used. How is it possible that a leather shoe from a discount supermarket costs a mere 19.90 euro? What kind of leather is used to make such a shoe, and under what conditions was this leather made? You won’t find answers to these questions in any colourful promotional pamphlets; these issues are brushed under the table, and shoes with a low retail price remain popular precisely because of said price. Unfortunately, drastic televised exposés are still necessary to awaken consumer conscience. SHOEPASSION.com loves quality leather and beautiful leather shoes; we also love our planet and the people living on it. It’s important that we remain fully cognizant of the origins and processing behind all the leather we use. Exploiting workers and the environment to maximize profits is the wrong way to go: sustainability counts! All of our shoe leather comes from Germany and France, taken from domestic hides and mildly tanned in strict compliance with environmentally-friendly regulations. We use leather soles made by the Trier-based Rendenbach tannery, which has used the same plant-based tanning method for the past 170 years. The Rendenbach process lasts a minimum of nine months, whereas competitors use chemicals to curtail tanning time to a mere four weeks. Accordingly, Rendenbach soles are more expensive, but they’re far superior in quality, particularly in terms of durability. Here, we let you take a look behind the scenes of this traditional, Trier-based family enterprise, one of the few tanneries remaining that still employs the oak pit tanning method. Naturally, we also exercise the same degree of caution in selecting our exotic leathers. All of the leathers used to make our exotic shoes have been sourced from specialized breeders who work in compliance with CITES guidelines. To make their leather soles, Rendenbach source the best hides from southern Germany, flawless in appearance and of the proper thickness. The raw materials are covered in salt and held in a hides warehouse prior to further processing. The hides are then cut into croupons and taken to the beamhouse, which, loudly humming like a washing machine, is conveniently located right next to the hides warehouse. In the beamhouse, big drums of water do their work, placed inside cylindrical wood and metal containers. These devices are used to return the hides to their original state. Sharp blades are also introduced to remove hairs, flesh, and connective tissues from the hides. The hides are now ready for tanning—at this stage, they’re referred to as ‘pelts’. The pits are mounted on a little trolley and taken to the pit yard across from the beamhouse, where a number of pits are filled with tanning solutions in varying concentrations. For an entire four weeks, the pelts are slowly tanned inside the pits. This dying process serves to open the fibre structure of the pelts, which makes it easier for the pelts to absorb tanning agents later on. The pelts are rotated between pits on a daily basis. The second stage of the tanning process takes place in the sunk hole. The sunk hole is a pit filled halfway with tanning liquor; the pelts are laid inside in alternating layers with sheets of tanbark. ‘Tanbark’ is the technical term for a mixture of ground bark, leaves and wood, all of which are extremely rich in tanning agents. The layered pelts and tanbark are lowered into the tanning liquor on a wooden slatted frame and left to stay this way for a minimum of six weeks. This is followed by processing in a second sink hole. The pelts are now finally ready for the actual oak pit tanning process, which is extremely gentle, yet very drawn-out. The process takes place in old, roughly three-metre-deep oakwood pits, in which the pelts and tanbark are once more stacked on top of one another and enriched with tanning liquor. This allows the tannins inside the tanbark to work their way into the protein structure of the pelts, where they are conserved. The tanbark is 100% natural, made of oak, spruce, mimosa bark, and valonea fruit. Oak pit tanning takes at least nine months, depending on the thickness of the pelts. After the pelts have completed the tanning process, they’re oiled with plant-based dubbin. This makes the leather supple and pliable. The pelts are hung up on a drying frame to slowly air dry, under strictly controlled conditions. After a week of drying, the pelts are dampened and rolled to thicken the leather, then air-dried a second time. Finally, the croupons are trimmed into their customary form. The traditional oak pit tanning process relies entirely on natural materials—leather that’s been treated this way can be safely composted, although of course that would be a waste. This environmentally-friendly tanning process creates long-lasting leather soles that are easy on the skin. Hanns Rendenbach has been at the helm of the traditional, Trier-based Rendenbach company since 1985, representing the fourth generation of family leadership. In our interview, he explains why Rendenbach leather is so good, what he thinks about shoes in general, and what he thinks about SHOEPASSION.com shoes in particular.